I wanted to write this post last night but it was a designated no-work zone blocked out in my calendar for family time. Perhaps that’s a side to flexible work that five businessmen are about to familiarize themselves with as they undertake The Equilibrium Man Challenge. The program is an initiate of the Workplace Gender Equality Agency that will follow the lives of five men, documentary-style, as they navigate workplace flexibility in their high powered careers for the very first time. A partner in a law firm, a professional who’s also an elite athlete, and three execs juggling work and family. 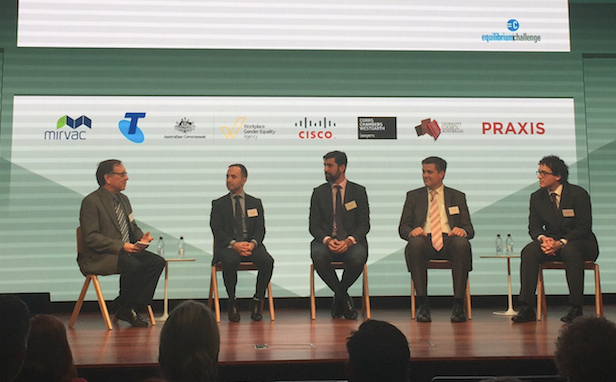 Already it has succeeded where no other affirmative action initiative has: there were as many men as women in the audience at yesterday’s launch (thanks to Telstra for hosting). And at yesterday’s launch we were treated to a sneak preview of the video episodes that will document the challenges men face as they try to carve out flexible work arrangements and restore some semblance of balance to their lives. They make for great viewing, are very insightful and (although it’s a serious subject) even had the audience in giggles several times – you can take a look here. While the circumstances and motivations of each e-Man is different, one thing is consistent: there was a common fear of how they would be perceived by their colleagues, clients and managers if they stepped outside of the standard worker profile. If they were perceived to be less than full-time-committed. To put some context around this, they all are grappling with making major changes to their work structure that include reducing from a 5 day to 4.5 day week, working from home a day a week or a day a fortnight, and committing to taking less work home with them at nights and on weekends. Okay… so maybe in the context of the inroads almost every woman I know has made towards flexible work – childless or not – they’re not such major changes. But the point is, men are a long way behind women on the flexibility front but it’s something that’s becoming increasingly important to them. And as was the case for women also, being the first one to ask can make it a really big deal to these fellas. And actually I think that it is. It is a big deal because these men now realize how much of a challenge it has been for their colleagues and direct reports to make flexibility requests in the past. It is a big deal because they are aware for the first time how tired they’ve been, how much of their personal priorities have shifted and been put on hold over the years, and how much family time they’ve been missing. And it is a big deal because, when they stepped up to the plate themselves and put their career on the line (or so they thought), many other men in their workplace made it known that they already have transitioned to flexible work. They just didn’t feel like they could talk to other men at work about it. Perhaps, finally, there’s a big shift about to happen here. Men are now getting true visibility to what has been a reality for women for so long, and they like what they see. Finally, flexibility isn’t just a women’s issue; men are burning out, breaking down and feeling the squeeze of a rigid work structure too and they now realize something’s gotta give. A study by the Diversity Council of Australia found one in three men under 35 are considering leaving their current employment due to the lack of flexibility it affords. That’s right. ONE. IN. THREE. This is definitely no longer a women’s issue. Move over The Bachelor. Women around Australia will be watching on with interest as the future episodes of The Equilibrium Challenge unfold!